Lantana montevidensis is a trailing form of Lantana and will only get 12-15″ in height with a 3-6 foot spread, making it a nice groundcover. The blooms are lilac pink to purple with yellow centers, appear in masses from spring to fall, and are great for attracting butterflies. 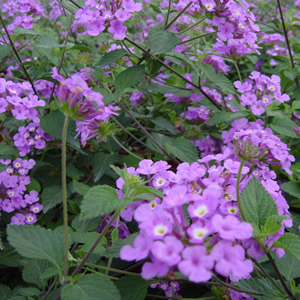 Purple Trailing Lantana’s foliage will change to a red to purple color in the colder months. The foliage is very aromatic and can irritate the skin of some people.